girl, and that she was...she was everything we thought she would be and more. wonderful people into our lives. 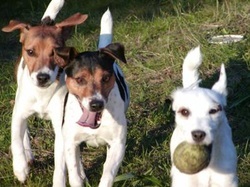 Our Jack Russell family has grown over the years, and most of them trace back to one of these three wonderful terriers. Like so many people who are interested in being owned by a Jack Russell terrier, we had searched for Inja for a over a year, looking as many people do when they start their search, for a particular "look" . 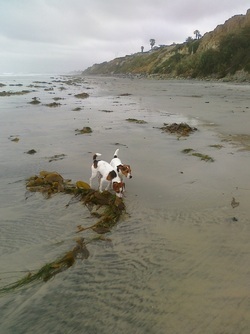 We both had known several Jack Russells that had endeared themselves to us in our lives before any joined our family. At the Equestrian center we had know Hoppy, the best friend of our Labrador Retriever, everyone seemed to know him...Barry had family members and friends that had terriers as he grew up. Particularly memorable was Biscuit a shortie Russell that had lost an eye falling off a hay truck, who could jump and catch a ball 5 feet in the air, smiling the whole time. lovely dogs and the"terrors " they can be. discriminately offered to pre-approved homes only. schedules, We begin their familiarity with collars, leashes, following, waiting, sitting as they develop their brains and personalities. Our involvement with our pups doesn't end with the sale, we will be available to you, to answer questions (no question is too silly) , offer suggestions and to help make your experience with your puppy and dog a successful one. We feel so strongly about our commitment,that if at any time you find you are unable to keep your terrier, we require you contact us FIRST, BEFORE you seek other placement options. We will assist you in finding an appropriate home or we will accept him/her back into our home. We are located on the outskirts of the beautiful San Francisco Bay area in Hayward, California. We live here with our terriers, our horses and family and enjoy our time with them all. We are proud members of the JRTCA. 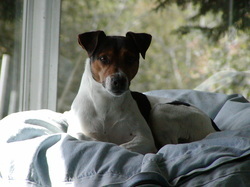 We are committed to preserve and protect the natural talents of the Jack Russell Terrier. We strive to educate prospective owners in the responsibilities, challenges, and rewards of Jack Russell Terrier ownership. 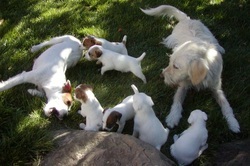 When we do choose to breed, we are dedicated to selecting quality Jack Russell Terriers that excel in intelligence, temperament, beauty, companionship, and working ability. We have litters on occasion, and should puppies become available they too are available only to pre-approved homes, let us know if you would like a puppy application to get on our waiting list !! if you are interested in obtaining one of these energetic little bundles of joy all your own. 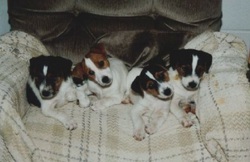 If you are interested in being owned by a Jack Russell, before you take that big step, a wonderful place to find information, is on the JRTCA (Jack Russell Terrier Club of America) website. If you are considering a Jack Russell Terrier we strongly recommend the Online Jack Russell Profiler for prospective owners before purchasing a JRT. Also, if you are willing to provide a home to a dog who needs a second chance please consider Russell Rescue , https://www.facebook.com/groups/russellrescueca/?ref=br_rs https://www.facebook.com/JackRussellRescueCA.org/?ref=br_rs or other rescue/shelter options when considering a JRT. There are many wonderful dogs available that are in need of loving, forever homes. Please Send us a contact form if you are interested in breeding opportunities, we have several beautiful intelligent accomplished stud dogs that you might want to consider, please introduce yourself to them on the following pages. We know that searching for a new dog, pup, and family member is a serious endeavor. Is you have researched your choices carefully and have a inquiry about available pups, dogs, or planned breedings and you have sent an inquiry or called, and we have not answered your e-mail or call, please keep trying. Our busy life sometimes delays our response to the many inquiries that we get. We are happy to answer all your questions and do our best to get back to you in a timely manner.